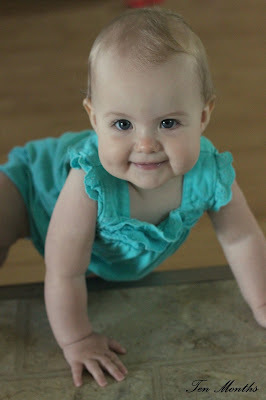 Far More Than Rubies: Happy Ten Months, Sophia! Stats- Sophia is in size 9 - 12 month clothing but will be moving in to 12 months stuff soon. She does not wear shoes yet but would be size 2 if she did. Sleep- Poor Sophia has been all messed up, sleep wise since getting to the States. Rampant diaper rash, jet lag, reflux flare up, and switching to room sharing with Grace has proven to disrupt her sleep habits. She currently gets up at 6 :30, naps from 8 to 930 and 2 to 4 and goes Down between 7 and 8. At night she's been waking between 1 and 2 needing a bottle. Hopefully we can work that out again. Food- Sophia takes a six ounce bottle, five times a day and eats whatever solids we happen to give to her. She eats about 50 percent baby food and 50 percent table foods. Activity- this month was a big one for Sophia! She travelled to the States and met her grandparents, and got settled into US life. She has been pretty easy going as she has been passed around and visited several church nurseries. She has gotten really fast at crawling and she still sticks one leg straight out behind her. She has let go while standing and stood by herself for several seconds but no steps have been taken yet. We love this age so much! Sweet cuddles, happy smiles, and an excited baby when she sees her Momma and Dadda!